Editor's note: Ron Paul is a Republican congressman from Texas who ran for his party's nomination for president this year. He served in Congress in the late 1970s and early 1980s and was elected again to Congress in 1996, serving continuously since then. Rep. Paul is a member of the House Financial Services Committee. Ron Paul says the nation is off track and Republicans have to rediscover their core beliefs. (CNN) -- The questions now being asked are: Where to go from here and who's to blame for the downfall of the Republican Party? Too bad the concern for the future of the Republican Party had not been seriously addressed in the year 2000 when the Republicans gained control of the House, Senate, and the Presidency. Now, in light of the election, many are asking: What is the future of the Republican Party? Once it's figured out what is fundamentally wrong with our political and economic system, solutions can be offered. If the Republican Party can grasp hold of the policy changes needed, then the party can be rebuilt. Party leaders concentrated only on political tricks in order to maintain power and neglected the limited-government principles on which they were elected. The only solution for this is for Republicans to once again reassess their core beliefs and show how the country (not the party) can be put back on the right track. The problem, though, is regaining credibility. After eight years of perpetual (and unnecessary and unconstitutional) war, persistent and expanded attacks on our privacy, runaway deficits, and now nationalization of the financial system, Republicans are going to have a tough time regaining the confidence of the American people. But that's what must be done. Otherwise, Republicans can only mimic Democrats and hope for an isolated victory here and there. And that's just more of the same that brought on the disintegration of the party. Since the new alignment of political power offers no real change, we will remain on the same track without even a pretense of slowing the growth of government. With the new administration we can expect things to go from bad to worse. Opportunity abounds for anyone who can present the case for common sense in fiscal affairs, for protection of civil liberties here at home, and avoiding the senseless foreign entanglements which have bogged us down for decades and contributed so significantly to our fiscal and budgetary crisis. During the debates in the Republican Presidential primary, even though I am a 10-term sitting Representative Member of Congress, I was challenged more than once on my Republican credentials. The fact that I was repeatedly asked how I could be a Republican when I was talking a different language than the other candidates answers the question of how the Republican Party can slip so far so fast. I concluded my answer by simply stating the Republican Party had lost its way and must reassess its values. And that is what needs to be done in a hurry. But it might just take a new crop of leaders to regain the credibility needed to redirect the Party. It certainly won't be done overnight. It took a long time to come out of the wilderness after 40 years of Democratic rule for the Republican Party to take charge. Today though, time moves more quickly. Opportunities will arise. The one thing for certain is that in the next four years we will not see the Republic restored. Instead the need for it will be greater than ever. The problems are easily understood and the answers are not that difficult. Abusing the rule of law and ignoring the Constitution can be reversed. If the Republican Party can grasp hold of the needed reforms, it can lead the way and regain its credibility. If power is sought for power's sake alone, the Party will never be able to wrench away the power of the opposition. In the past two years, I found that when the young people heard the message of liberty, they overwhelmingly responded favorably, fully realizing the failure of the status quo and the need to once again endorse a system of self reliance, personal responsibility, sound money, and a non-interventionist foreign policy while rejecting the cradle-to-grave nanny state all based on the rule of law and the Constitution. To ignore the political struggle and only "hope for the best" is pure folly. The march toward a dictatorial powerful state is now in double time. All those who care -- and especially those who understand the stakes involved -- have an ominous responsibility to energetically get involved in the battle of survival for a free and prosperous America. 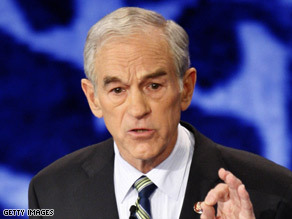 The opinions expressed in this commentary are solely those of Ron Paul.